Beautiful Property Nearly 5 sub-dividable Acres with Ranch Home is one of the Best Lots in New River. NO wash, NO flooding, Hillside, Nearly Flat, ALL usable property. Amazing 360 Mountain Views. Private Well set to 11 gal a minute w/ 3000 gal holding tank. Approx. 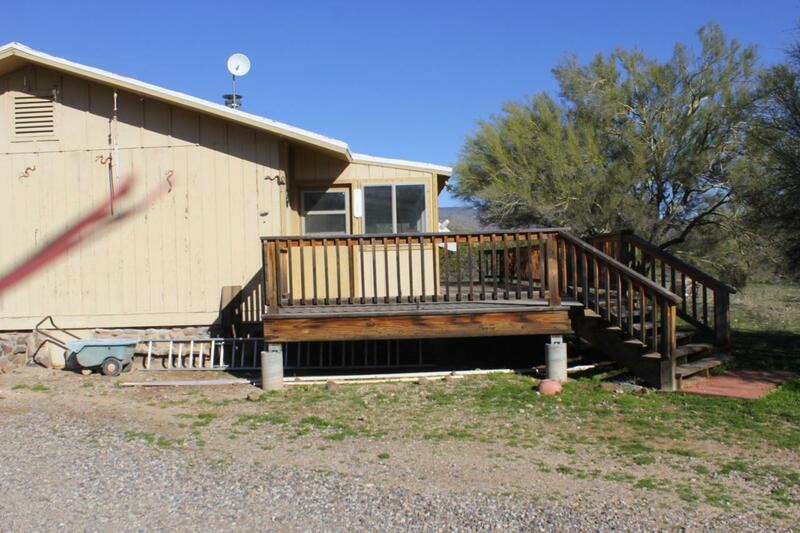 2 back acres bladed with Covered Horse stalls. Front Acreage Remains Natural High Desert. Tonto Forest is Right around the corner. Own your own Ranchette, Bring the horses. Relax on the Sun porch or Redwood deck and enjoy the Spectacular Views. 4 Bdrm, 2 BA, Kitchen, Family Room with Brick Fireplace, Formal Dining and Formal Living Room with Wood Burning Stove, AZ room, Large Mud Room & Laundry Room, Covered Patio. Home & Detached Workshop/Garage need some updates. Land needs some TLC. No flood insurance required.Water lines to back bladed acreage. Electrical panel in workshop to outside corral lights. Property can be divided into 4 parcels and private Well produces enough water for 4 homes per Contractor.